Mickey Mantle was born in Spavinaw, Oklahoma. He was named in honor of Mickey Cochrane, the Hall of Fame catcher from the Philadelphia Athletics, by his father, who was an amateur player and fervent fan. Apparently his father was not aware that Cochrane's real first name was Gordon. 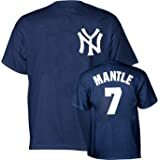 According to the book Mickey Mantle: America's Prodigal Son, by Tony Castro, in later life, the New York Yankee great expressed relief that his father had not known this, as he would have hated to be named Gordon. Mantle always spoke warmly of his father, and said he was the bravest man he ever knew. "No boy ever loved his father more," he said. His father died of cancer at the age of 39, just as his son was starting his career. 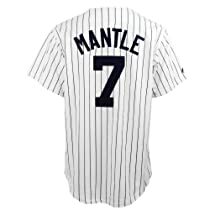 Mantle said one of the great heartaches of his life was that he never told his father he loved him. MLB baseball player Mickey Mantle, a center fielder, was a three-time American League Most Valuable Player having won in 1956, 1957 and 1962. Below are his MVP stats. For his career stats, click here. 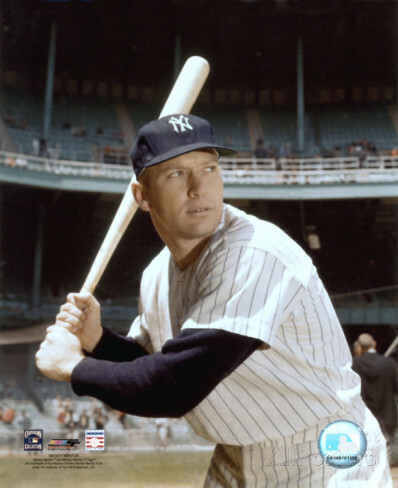 Featured here are Mickey Mantle posters, photos, giant collectibles and apparel.